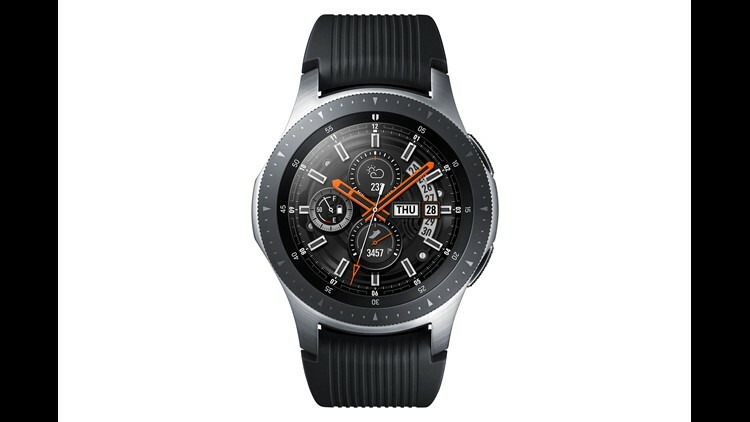 A 46mm Samsung Galaxy Watch. Apple has dominated the smart watch category ever since the Apple Watch arrived in 2015, so it is easy to forget that Samsung got to the market quite some time before – anyone recall 2013’s Galaxy Gear watch, by chance? But Samsung hasn't had near the success with any of the smart watches it has introduced along the way that Apple is apparently enjoying now. On Thursday, Samsung came at its rival again with the introduction of the Galaxy Watch techie timepieces that are meant to compete hard against the Apple Watch. 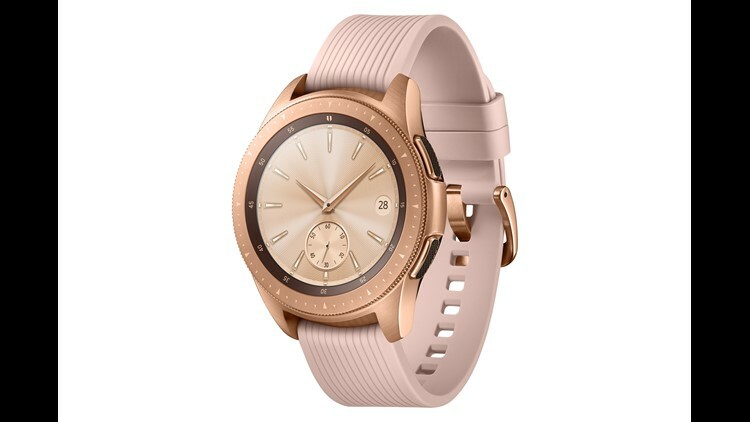 Samsung’s latest entries will be available in two sizes and color finishes when they show up Aug. 24 – 46mm silver, and 42mm midnight black and rose gold – with the ability to swap standard-sized bands from Samsung and outside companies. Samsung said these will eventually include bands from luxury brands, but none were on display at the Barclay Center in Brooklyn, where the company launched the new watches. The new Samsung watches start around $330 for the 42mm Bluetooth version and around $350 for 46mm. Prices for versions with LTE cellular connectivity haven't been announced. By contrast, Series 1 (first generation) Apple Watches start at $249; Series 3 starts at $329, or $399 for models with both GPS and cellular. As with many products in the wearables category, Samsung is pitching Galaxy Watch at those of you who want to monitor your health and stay fit, though you can use the watch for a slew of other purposes – to glance at notifications or your calendar, stream Spotify, answer calls and texts, use GPS maps and transact using Samsung Pay at stores that have NFC (Near-field Communication) terminals. Samsung is generally pushing the watch as an interface into a holistic ecosystem that includes the Samsung Health app, the company’s Bixby virtual assistant and all the various internet-connected appliances that are compatible with Samsung’s SmartThings smart home solution. You can imagine the watch someday communicating with an internet-connected Samsung fridge to let you know at the grocery store when you're out of milk. The handsome water-resistant watches have a round touch-screen face bordered by a circular bezel you can rotate to navigate what you see on the screen. The one I briefly put on felt comfortable enough. You can access more than 60,000 different watch faces in the Galaxy App Store – Apple still doesn’t make any optional third-party watch faces available on its timepieces. The new watches automatically track walking, running, cycling, elliptical, training, rowing and dynamic workouts – and also sport 21 new indoor exercises from a selection of 39 activities. The watches can help you track your food and water intake as well and also monitor your overnight sleep cycles. That last feature is something the Apple Watch does not do, and if you’re going to wear a watch while catching your Zzzs, it also means that the Galaxy Watch best have very good battery life, which has been a problem on prior Samsung – and for that matter – other brands’ smartwatches. On the larger of the two Galaxy Watch models, Samsung is touting up to four days with “low usage” – however that is defined – and two to three days on the smaller watch. Models that have LTE cellular connectivity should not last quite as long. On my own second generation Apple Watch (without cellular connectivity), I get roughly a day-and-a-half of juice between charges. An Apple Watch requires you to have an iPhone, but Samsung isn’t making you buy a Samsung device to wear a Galaxy Watch. It's compatible with other Android devices and even the iPhone. Yet despite its advantages, “Samsung has an uphill battle to fight (against) the Apple Watch,” says Patrick Moorhead, principal analyst at Moor Insights & Strategy in Austin, Texas. The numbers apparently bear him out. In the first quarter of 2018, the IDC research firm reported that the Tizen operating system inside Samsung’s watches had just a 9.9 percent of the global market share for “smart wearables,” compared to 47.1 percent for Apple’s watchOS. Samsung also trailed wearables based on Android (20.6 percent) and a variant Android Wear (8.9 percent). Meanwhile, though Apple doesn’t break out sales for its watch, CEO Tim Cook recently stated that the Apple Watch delivered a record June quarter performance with growth in the mid-40 percent range. Only time will tell, of course, whether the Galaxy Watch can help Samsung make up any significant ground.